12-hour car trips are certainly quite something. It’s almost the same concept as airline flights: once you’ve flown on an immensely long flight, then all the other ones don’t seem as bad. Having done two 12-hour drives in the past two months, I think I’m going to take a break from those for a while. Back in mid-April, a bunch of us from school took a drive out to Wichita, Kansas to compete in the annual Design/Build/Fly competition. Having heard much about the fabled Kansas barbecue, we were all very eager to stop by in Kansas City on the way to Wichita to give it a try. 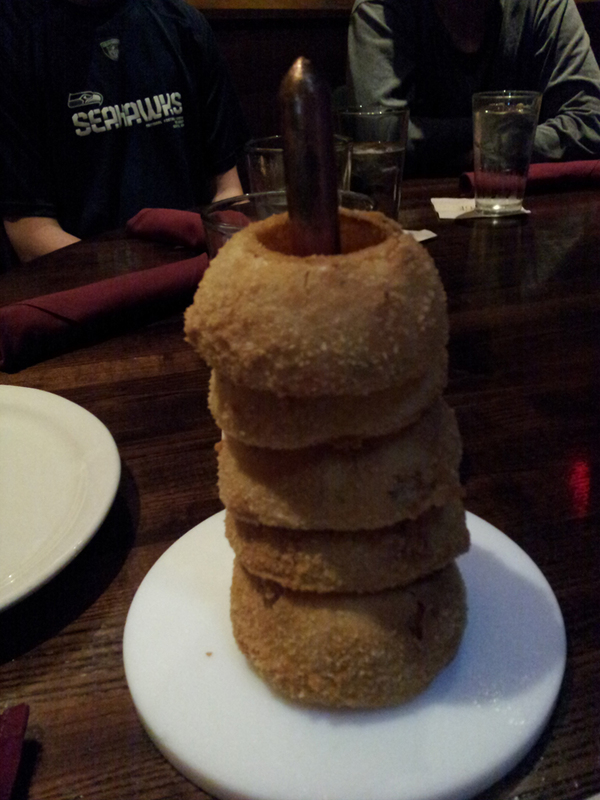 One of the other guys on our team recommended that we all stop at Jack Stack; it was definitely well worth it. I could tell when we walked in that this barbecue place was a little more upscale that I had been expecting. We were all dressed in our jeans and T-shirts, but people around us were wearing polos or button-downs, more than likely coming straight there to eat after work. It was also noted that the prices were also a little more on the upscale side. But hey, the opportunity to eat some quality Kansas barbecue doesn’t come around often, so I didn’t mind paying a little extra for my meal this time. 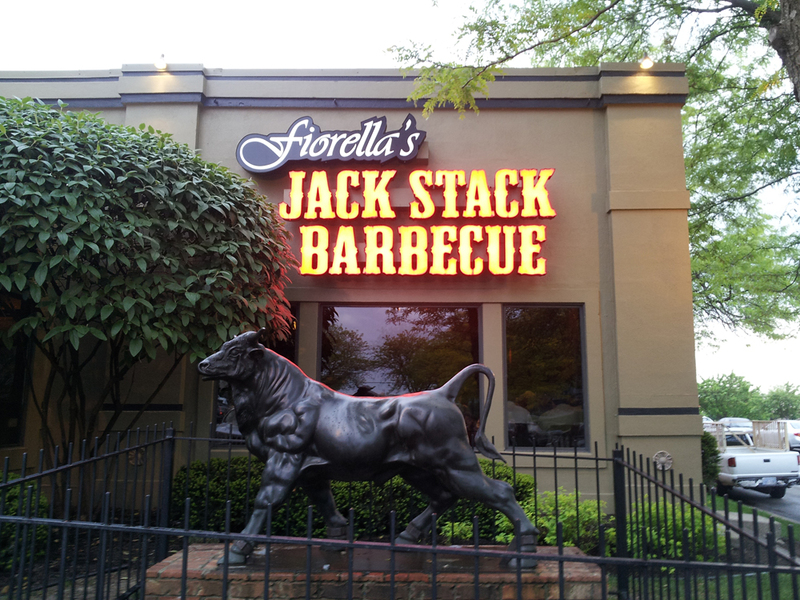 After reading that Jack Stack had the acclaim of being Zagat’s Highest Rated BBQ in the country, I had some pretty high expectations of this place. I ended up going with their Barbecue Sampler, featuring a selection of four meats: barbecue chicken, beef burnt ends, pork spare ribs, and Polish sausage. I was extremely impressed with everything except for the chicken, which was plated without any sauce and seemed a bit dry. Luckily, the other items on the plate had some extra sauce that came to the rescue. However, the spare ribs were done really well, practically falling right off the bone. There was a great smoky flavor in the meat complemented by the tangy barbecue sauce. The Polish sausage was really moist and also had a great flavoring to it as well. But those burnt ends. Oh wow. Even now, as I write this post quite a time since we visited the restaurant, I can still remember such an explosion of smoky flavor and such tender meat that it practically melted in my mouth as soon as I took a bite. Those were truly phenomenal, and if I ever get a chance to go back, I would gladly order an entire plate of those burnt ends. They were done so well and were amazingly delicious. I’m getting hungry all over again just thinking about it! Don’t pass up the opportunity to give Kansas barbecue a try, even if you’re more privy to styles of barbecue from other regions in the country. You never know what you might be missing out on. 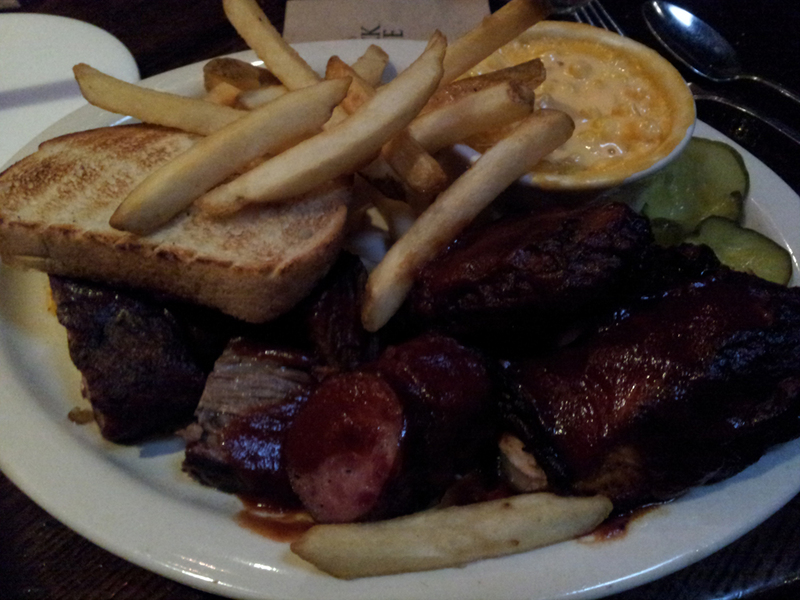 I would gladly recommend Jack Stack Barbecue for anyone to try. Great smoky flavor present in all of their meats that I had on my sampler, with a pretty good sauce as well. But man, those burnt ends. The smoky smell wafting out from the kitchen keeps you hungry while you’re at the table. The restaurant’s lighting was a little bit on the darker side as well. Our waiter seemed a little bit rushed with us at times, but our food came out in pretty good time and he did come around to make sure our drinks were full. The prices here are certainly what you would pay for a classy dinner, and I considered what I had to be some classy barbecue.